This small tabletop fountain can be created without any tools other than a sympathetic eye tuned to the opportunities that exist when moving water meets a simple assembly of natural stone. It has the shady feel of a woodland stream, where freeze and thaw expose new surfaces of bedrock to the water's caress every year. Ranging mountains contain countless springs such as this one, where clear water flows from the hillsides to fall over ledges of broken shale, tufted with mosses, ferns, and russet columbines. The flat surfaces presented when stone first breaks from the ground allow easy stacking and stable operation. 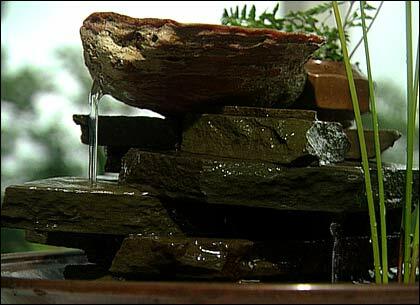 Thus, some of the best stone for this fountain can be purchased at a nearby quarry or landscape stone company. I found my stone in an Appalachian river, rounded at the edges but still flat sided and stackable. Click image to see full diagram. Selecting your reservoir may be as simple as digging out the brown oval ceramic baking dish that was a wedding present 20 years ago and requires only a dusting off. If no such treasure is available to you, visit flea markets and import shops to find something beautiful. It can be made of ceramic, resin, metal  anything that holds water. Seal any small leaks with clear silicone caulk. Set the pump in the bowl, fill the bowl, and plug in the pump. Be ready to unplug it if the water spouts into the air and out of the bowl. Adjust the flow control until you create a gentle flow a few inches high. Stack slabs of flat stone around and finally over the pump. When you have created an island of stone and can imagine where you would like to see the stream begin, unstuck the stone, cut short lengths of different sizes of hose so that they can be telescoped together to reach the place where you see the stream beginning. Fit them together, making sure that the upper end can be coaxed into a right-angled bend without crimping shut, and attach to the pump. Now rebuild your stone pile so that it contains and conceals the tubing, which ends with a right-angled bend form the vertical to the horizontal so that water comes out from beneath one of the upper stones. You may need to rebuild your waterfall several times to achieve the pattern of flow you want. You will learn things as you move the stones around and listen to the changes in sound. Here's a way to amplify the sound in a small fountain: Create a small drop for the water with the surrounding stone overhanging slightly, forming an acoustical amphitheater. 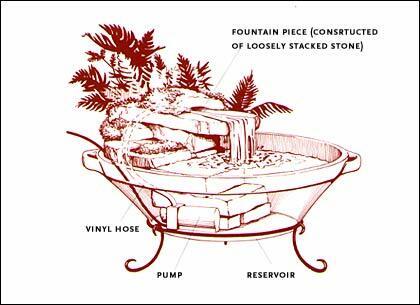 If you like, add some decorative elements, such as polished stones, tiny sculpture pieces, or small shells  whatever you feel is necessary to make the fountain uniquely suited to you and the location you intend to place it. 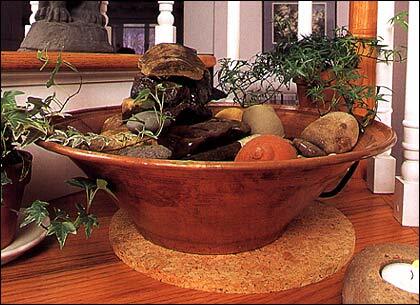 Add small clumps of moss and ferns, if you have access to them. If not, you can buy bromeliads (plants that thrive on nutrients derived from air and rain  not aquatic plants suitable for planting under water) and press them into recesses in the stones above water. Ferns and moss, however, can thrive with some water running over some of their roots, as long as their leaves are out of the water. This segment appears in show #2720. Reprinted from Simple Fountains for Indoors and Outdoors, by Dorcas Adkins (1999). Used by permission of Storey Books, Pownal, Vermont. All rights reserved.